75W Eleaf iStick Pico TC MOD Kit W/O Battery, max output 75W, supports VW/Bypass/TC-Ni/TC-Ti/TC-SS/TCR Mode. It features replaceable single 18650 Cell and compact size. 14 colors for your selection. I feel that every e-cigarette user will not be unfamiliar with Eleaf iStick, in the previous launch of the product, there is no lack of a mini-portable host, in today’s host features more and more upsurge, iStick launched their new generation of mini Host Pico. I am a mini-host poisoning, going out with a single power mini host, but helpless the various brands of mini-host in the function also lacks a certain degree of playability ……… I feel more nonsense. I took this time to use this iStick PICO personal experience to bring you. Go straight! Please have our Miss PICO! Packaging as shown, carton texture is good, the upper left corner marked out a striking logo “can be the firmware upgrade.” But the official website has not yet upgraded package, hope that the next generation of firmware upgrades can improve the inside of the software BUG. The entire package contains a PICO host, a MELO III MINI finished core atomizer, a spare atomization core, spare apron, USB cable, all English manual. Mini-host is also no lack of excellent products, many of my friends are in love with this petite host is to go out to really feel convenient to carry, you would rather take a battery or with a dual power host? Why would I say it is a little magic box? IStick PICO If only because of a mini feature, I believe that this depth of experience will not appear, indeed it contains a lot of features inside I think there is a very high playability: power mode 75W, NI / TI / SS three Section of the mainstream temperature control mode, TCR wire temperature control mode. For such a small machine can have these features, I asked myself, there are other hosts need to choose? The package contains a MELO III MINI finished core atomizer with two finished fog scores of 0.3 and 0.5 ohms. In fact, in the evaluation of the bus, friends have done this set of evaluation of the package, part of the atomizer I no longer start in detail, just talk about their own use of the feelings. excellent workmanship, size is also moderate, you can top oiling. hidden intake design failed to completely close the intake. the actual use, the taste is not ideal, smoke and taste are subdued. no matching temperature control core. The battery cover is at the top, this design is rare. Positive pole down, there is a negative symbol in the battery cover, the players pay attention to like. As the bottom of the air outlet is through the battery compartment, we still have a place to seriously attention, do not put the host into a place where the water, the water inside the battery compartment to the trouble. [Plus/minus] button at the bottom, for normal use, when the ignition, the impact is not great. But once the need to switch function, it is more trouble, it is difficult to complete the operation through a hand. Designed to this, probably because the host is too small, the designer because of the placement of the chip restrictions and compromise it. PICO has six operating modes, the figure has been clearly marked out of each mode corresponding to the screen. As a result of supporting the instructions without Chinese, but also think of such a reasonable price of the package should be considered a good choice for entry, concerned about the entry of the novice, where I may be long-winded host the operation, the old bird can ignore my long-winded The. Switch mode: press the three key in succession, enter the mode selection, press the [Add / Decrease] key to select the mode, and finally press the ignition key to confirm. PICO has a “close eye” mode “Stealth” (sorry to take this picture a little hand-disabled. Paste, barely able to see). [ON / OFF] Turns on and off by pressing the combination key “Ignition key + key”. Feel this function is designed to save power, in fact, has been maintained in the Stealth OFF state can be. Have to see me above the map, will see that I was with a drop of oil atomizer to use, in my use, the double resistance of 0.35 ohms, 50% of the power output above the situation is stable, the delay can feel out, but Not affected. If you choose this host to use the voltage regulator mode, is fully capable of non-extreme smoke players outside of all the circumstances. But in the use of high power, the host because of the single power design, the ability to hold is not ideal, if the use of 35-50W output, single power half a day you need to replace the battery (power less than 25% Too stable). Pass through the model should be simulated mechanical bar violence output it, PICO support resistance of 0.1 Europe -3.5 Europe. There is nothing to refine on the pass-through model. I also here with a pass, the following into the temperature control mode experience introduced. 1, the use of temperature control, you must first lock the initial (room temperature cooling) resistance. Very important! Very important! Very important! 2, PICO is calculated by the host chip heating power to control the temperature. Temperature control mode power value for the highest value of heat, such as the figure 45W, in the temperature control process, the maximum power of the host is 45W. The other so push, PICO maximum power 75W. The method of switching W number: In the temperature control mode, press the key twice, the host will enter the interface to set the number of W, [plus / minus] key for the number of W adjustment, the last ignition key to confirm. 3, the atomizer installed at room temperature to the host, the host will automatically identify the resistance value, then the figure on the lock on the mark for the ohm mark (this symbol is not locked on behalf of the resistance), by pressing the combination of key “key + Plus key “lock resistor, the host will display the” lock mark “as shown above. 4, the temperature of the unit C-F switch is simple, to see their own habits to choose. Such as 600F, then press the key, it will automatically switch to 100C. NI200 coil for today’s most widely used and stable temperature control coil, then in such a more mature mode, PICO’s output performance is relatively stable, the temperature coefficient is no longer necessary to push very high to normal atomization, for example, before I In the use of JOYETECH products using NI temperature control, the general temperature will be set at about 460F in the normal full atomization, but in this PICO, basically 420F can be achieved. If you want the core carbon deposition is relatively small, you can put W appropriate pressure in the low value, the actual data according to their own taste requirements. correct! NI temperature control of cotton can be relatively low-pressure mode put a little less. Titanium wire temperature control when the players were hailed as the closest to the A1 wire taste of the temperature control options, titanium wire can also be loosely around the argument, I published in the forum CUBOID host use, has been discussed How to smoke out of the normal titanium wire mode through the TCR to optimize. PICO Titanium Wire mode, I received the host also has such a defect, the smoke is not normal. Then I will solve this problem in the TCR inside. Titanium wire is also recommended loosely, as for the reasons, I will be detailed below. SS compared to NI and TI two models of the emergence of a little later, if the NI coil is too soft, TI’s coil elasticity is too large, then the balance of the 33316 coil is obviously jumped out. but! Entry host I used the SS temperature control is also not a relatively satisfactory, we look at the performance of PICO. A friend said SS316 can be close, in fact, I personally recommend loose around. Close the recommended application to the voltage regulator mode. Temperature control has two very important premises, first of all, the resistance should be correct, followed by the coil heat to be uniform. If close, the coil before and after the heat is from the inside out. In other words, your tight coil in the temperature control mode is not even heating, generally close to the middle than on both sides to heat a lot. PICO in SS temperature control mode of the performance gave me a surprise. Smoke out of the normal, no soft feeling. I use the Corolla atomizer as a test, coil as shown. The taste is light, but the taste is reduced and the atomization is good. I can responsibly say that this PICO SS temperature control mode, in the case of correct coil operation, absolutely can be used. And I also use a few days, for the time being without any unusual situation. SS mode, some use a small experience Tip: 1 / feel the taste of metal? Look at the temperature setting is not too high, I smoked two horses to oil, 400F for their best; 2 / is not feeling too much atomization? To ensure that the temperature OK case, look at the number of W set, not too high. I lock myself 30-40W. TCR model of some applications seemingly can query the information is not much. In fact, many manufacturers have introduced TCR function, why not a relatively standard related tutorial? Before I made a forum on the JOYETECH CUBOID TCR use, interested friends can search the bus forum. 4, modify the ignition key or stay 10 seconds does not operate, you can confirm and save the settings and jump out of the TCR settings interface. 5, for example, I set the M1 value of 420, after I use the M1 file temperature control is 420, the corresponding parameter table, I use the titanium wire manual temperature control mode. Not that titanium wire is out of smoke is not normal? 400 is its temperature protection point, we will slightly increase it. The value can slowly try their own, but not too far from the official given the reference value. TCR use is not difficult. We can optimize the temperature control experience with the corresponding parameter changes. For example, SS mode is too violent? We changed the 200 to 190; TI smoke very little? We changed 400 to 420. The above TCR operation method is purely for your own experience. We hope that there is mistake or misleading place We can please me in good faith. Thank you for your understanding. If the A1 wire voltage regulator mode is our most respected way, then the temperature control will be a future development trend, the reason is very simple, it can be more stable for the players to provide a more stable taste, the problem lies only in the current Technical restrictions, temperature control has not been able to play a perfect idea of the effect. The current temperature control is through the heating wire material and resistance characteristics, calculated by the chip out of a simulated temperature to achieve the purpose of our temperature control, then with the TCR regulation, the players can more freedom to master their own parameters to control their own Need the taste. According to my own understanding, temperature control does not exist a real temperature, they are just a combination of data values, the rational use of this combination, you will get a stable output. Of course, these pressure in the pressure mode of violence will have a different taste, this is another question about the taste of the taste. I am a mini-host poisoning, like this has a very good playability and petite host, I am very recommended to be your out of the equipment. the traditional A1 mode output stable, drip / oil atomizer take-all! the original voltage regulator mode, NI temperature control mode, SS temperature control mode has been relatively good, hand to experience. the bottom of the cooling hole through the battery cathode, if not careful on the place where the water, easily lead to short circuit. the original set of nebulizer sets of raw gas, it is recommended that manufacturers can launch stand-alone version for the players to buy. there is no Chinese manual, for a so many functions of the host, the domestic novice players have some trouble to get started. [plus / minus] the location of the key settings, the operation is more inconvenient. 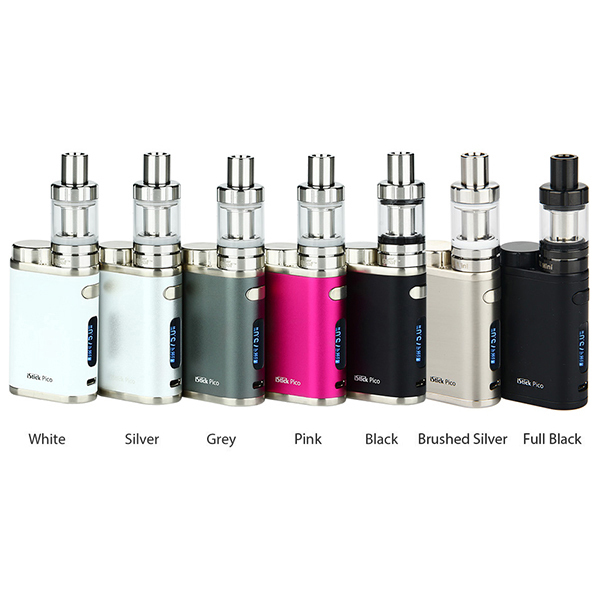 How to Buy 75W Eleaf iStick Pico TC Full Kit?